Emily Ira releases a pitch. 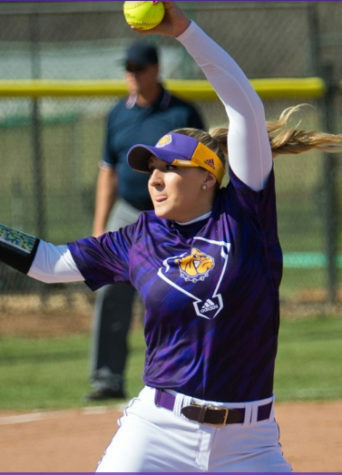 CHICAGO — The Western Illinois softball team were on the road once more this past weekend for their last non-conference matchup before heading into the final stretch of The Summit League. 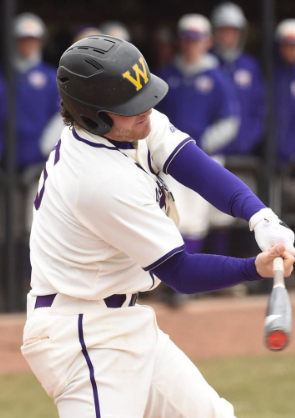 The Leathernecks faced off against the Flames of the University of Illinois-Chicago in a doubleheader this past Saturday. While UIC may be the Flames, it was Western’s bats in game one that were on fire. Jasmine Lara reached on a leadoff single and was advanced by a Payton Abbott bunt single. Hailey Duwa hit an RBI single that scored Lara and advanced Abbott to third. Abbott scored off of a Halle Hollatz single in the next at bat. Pitcher Emily Ira was hit by a pitch that loaded the bases for Meghan Henson. A wild pitch by UIC starter Marley Hanlon not only scored Duwa and advanced the other two runners, but it also led UIC head coach to remove Hanlon in favor of Karissa Frazier. Henson struck out for the second out of the inning, but Aly Compton followed her up with an RBI single. 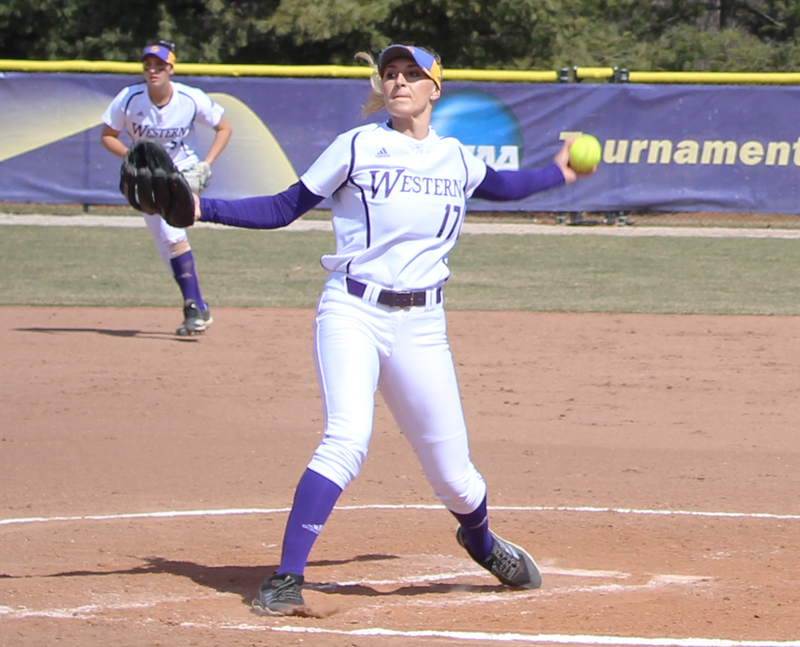 Alyssa Ealy grounded out for the third out of the inning, but not before the Leathernecks racked up five hits and four runs. The Flames were quick to get on the board as well in the bottom of the first when senior Skylee James homered to right center, bringing the score to 4-1 after one. Jasmine Lara got her second hit of the game with a single in the top of the second but was stranded on second to end the inning. Western found the plate once again in the top of the third. The inning led off with a double by Ira who advanced to third after a throwing error occurred during a single by Compton. Ira was be driven in when Lara singled to left field for her third hit and first RBI of the day. The Flames once again scored immediately after Western when James tripled in the bottom of the third and crossed the plate after an error by Henson. With James’ run, the Flames shortened Western’s lead to 5-2 after three. Western broke open their lead in the top of the fifth. Ealy got to the party with her first hit of the game, a single up the middle. Lara walked and Abbot was hit by a pitch to load up the bases for Sydney Hollings. Hollings recorded her first hit and RBI of the day with a single to center field that scored Ealy. Frazier walked Duwa and sent Lara across the plate for another Western run. Western scored once more all the way in the top of the seventh off of a single by Ira that scored Hollings. Western went on to win game one 9-4 with Ira getting the win. Ira pitched a complete seven innings and surrendered four runs, three earned, off of eight hits while also tossing nine strikeouts. Western took an early 2-0 lead in the top of the first of game two, but Skylee James responded quickly once again with a two run home run to tie it up. UIC scored three more in the bottom of the second to give them a 5-2 lead, a lead they did not relinquish the rest of the game. Hollatz hit an RBI single in the top of the third to bring the Leathernecks within two but score another in the bottom of the fifth to cement their 6-3 lead. UIC prevented the sweep with a 6-3 win in game two. Western returns to Summit League play next weekend when the Purple and Gold travel to Grand Forks, N.D. to face conference foe North Dakota. Game one on Friday is set to begin at 7 p.m.